Some years see outperforming currencies of the previous year become laggards in the next. We do not think this will be the case for the Norwegian krone and further gains for the currency are due. The ascent that the NOK has made in 2018 has been founded on higher oil prices and interest rate hikes by the Norges Bank. Whilst the first catalyst may lay in doubt, we expect that the central bank will be more than willing to keep raising interest rates in the coming quarters. Inflation is currently beating the Bank’s 2% target handily – the latest reading in November was 3.5% – and with core rates above 2% as well, the Bank will be more than happy to, slowly but surely, bring interest rates back to a level that is seen as ‘normal’. A risk to all of this is Eurozone growth given the geographical weight of trade between the two currency areas. USDNOK hit 9.00 briefly in 2017 and has averaged 8.10 through 2018, we think that the pair could test 8.00 through 2019. 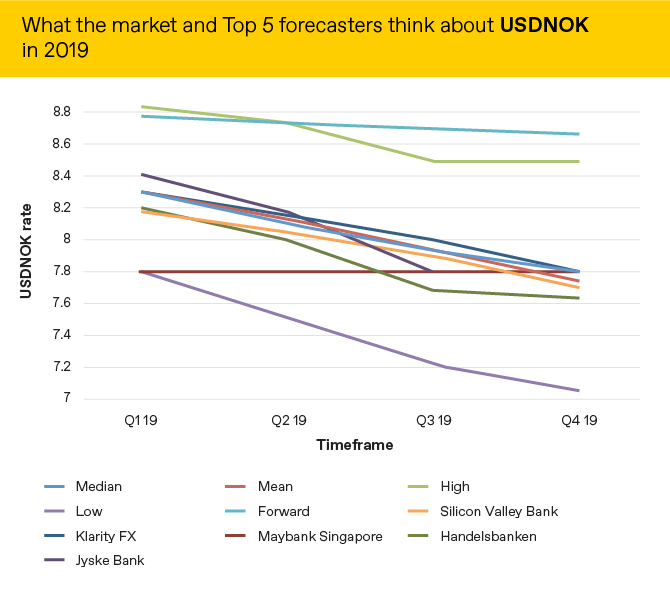 Market expectations of what will happen to the NOK versus the USD are below alongside the predictions of the 5 most accurate forecasters as measured by Bloomberg.